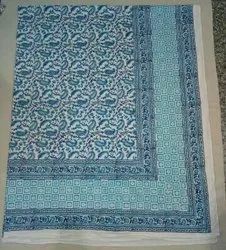 We manufacture and export a wide range of Beautiful Sanganeri Hand Block Printed Bedsheets. 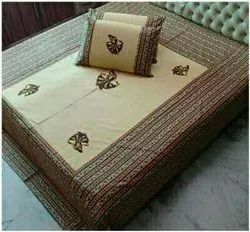 These Bedsheets are made from high quality cotton fabric. Each piece is a master of art as it is handcrafted with Rajasthani style cotton Bedsheet. 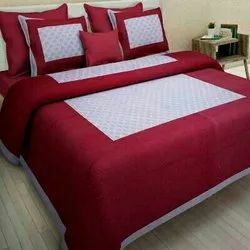 These Bedsheets are offered in variety of designs, sizes and colours. 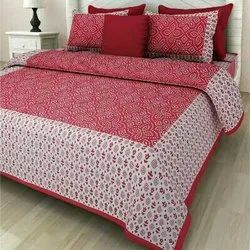 Add a bit of color to your bedroom setting with this Jaipuri Print Designer Pure Cotton Double Bedsheet Set. It is graced with latest Designs to give an ethnic yet modern glance to your room Decor. 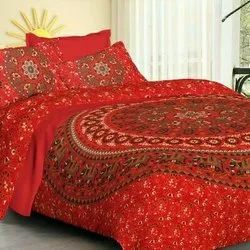 This beautiful bed sheet set is a specialty of Jaipur. Made from 100% Pure Cotton, this Bed Sheet ensures durability. The bed sheet set is in bright and traditional Rajasthani Hand-Block prints to enhance your decor. The matching Two Pillow Covers that come with this bed sheet completes the whole look of your bed and bed sheet. 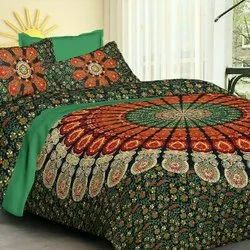 Add a bit of color to your bedroom setting with this Jaipuri Print Designer Pure Cotton Double Bedsheet Set. It is graced with latest Designs to give an ethnic yet modern glance to your room Decor. This beautiful bed sheet set is a specialty of Jaipur. Made from 100% Pure Cotton, this Bed Sheet ensures durability. The bed sheet set is in bright and traditional Rajasthani prints to enhance your decor. The matching Two Pillow Covers that come with this bed sheet completes the whole look of your bed and bed sheet. 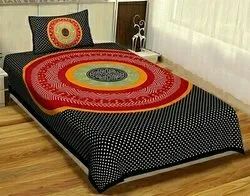 Add a bit of color to your bedroom setting with this Jaipuri Rapid Print Designer Pure Cotton Single Bedsheet Set. It is graced with latest Designs to give an ethnic yet modern glance to your room Decor. This beautiful bed sheet set is a specialty of Jaipur. 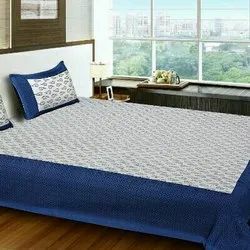 Made from 100% Pure Cotton, this Bed Sheet ensures durability. The bed sheet set is in bright and traditional Rajasthani prints to enhance your decor. 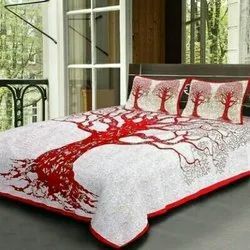 The matching One Pillow Cover that come with this bed sheet completes the whole look of your bed and bed sheet. 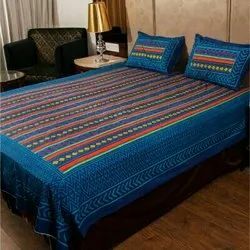 Add a bit of color to your bedroom setting with this Jaipuri Hand Block Bagru Print Designer Pure Cotton Double Bedsheet Set. It is graced with latest Designs to give an ethnic yet modern glance to your room Decor. This beautiful bed sheet set is a specialty of Jaipur. Made from 100% Pure Cotton, this Bed Sheet ensures durability. The bed sheet set is in bright and traditional Rajasthani Hand-Block prints to enhance your decor. The matching Two Pillow Covers that come with this bed sheet completes the whole look of your bed and bed sheet. we offering quilts and blanket at best price. 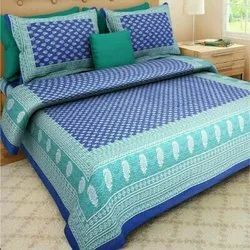 Add a bit of color to your bedroom setting with this Jaipuri Hand Block Print Designer Pure Cotton Double Bedsheet Set. It is graced with latest Designs to give an ethnic yet modern glance to your room Decor. This beautiful bed sheet set is a specialty of Jaipur. Made from 100% Pure Cotton, this Bed Sheet ensures durability. The bed sheet set is in bright and traditional Rajasthani Hand-Block prints to enhance your decor. The matching Two Pillow Covers that come with this bed sheet completes the whole look of your bed and bed sheet. 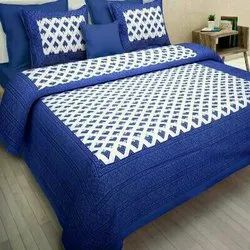 Double Bed Sheet-Hand Block Patch Work-90x108"
Add a bit of color to your bedroom setting with this Jaipuri Hand Block Patch Work Designer Pure Cotton Double Bedsheet Set. It is graced with latest Designs to give an ethnic yet modern glance to your room Decor. This beautiful bed sheet set is a specialty of Jaipur. Made from 100% Pure Cotton, this Bed Sheet ensures durability. The bed sheet set is in bright and traditional Rajasthani Hand-Block prints to enhance your decor. 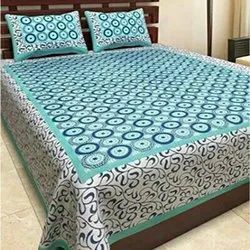 The matching Two Pillow Covers that come with this bed sheet completes the whole look of your bed and bed sheet. 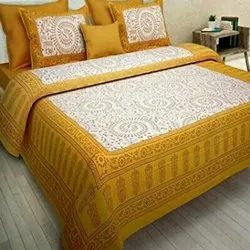 Add a bit of color to your bedroom setting with this Jaipuri Hand Block Gold Print Designer Pure Cotton Double Bedsheet Set. It is graced with latest Designs to give an ethnic yet modern glance to your room Decor. 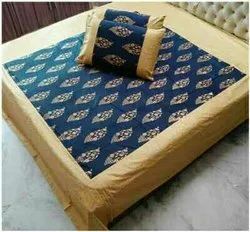 This beautiful bed sheet set is a specialty of Jaipur. Made from 100% Pure Cotton, this Bed Sheet ensures durability. The bed sheet set is in bright and traditional Rajasthani Hand-Block prints to enhance your decor. The matching Two Pillow Covers that come with this bed sheet completes the whole look of your bed and bed sheet. 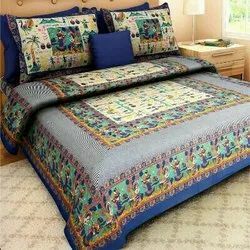 Add a bit of color to your bedroom setting with this Jaipuri Multi-Color Hand Block Print Designer Pure Cotton Double Bedsheet Set. It is graced with latest Designs to give an ethnic yet modern glance to your room Decor. 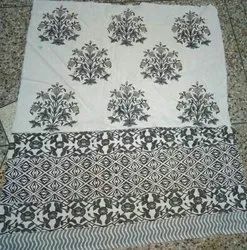 This beautiful bed sheet set is a specialty of Jaipur. Made from 100% Pure Cotton, this Bed Sheet ensures durability. The bed sheet set is in bright and traditional Rajasthani Hand-Block prints to enhance your decor. The matching Two Pillow Covers that come with this bed sheet completes the whole look of your bed and bed sheet. 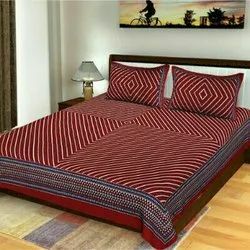 Add a bit of color to your bedroom setting with this Rajasthani Hand Block Print Designer Pure Cotton Double Bedsheet Set. It is graced with latest Designs to give an ethnic yet modern glance to your room Decor. This beautiful bed sheet set is a specialty of Jaipur. 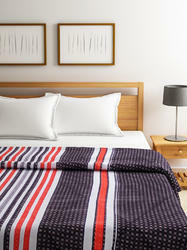 Made from 100% Pure Cotton, this Bed Sheet ensures durability. The bed sheet set is in bright and traditional Rajasthani Hand-Block prints to enhance your decor. The matching Two Pillow Covers that come with this bed sheet completes the whole look of your bed and bed sheet. 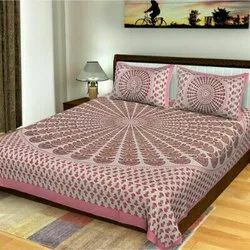 Double Bed Sheet-Tie n Dye Hand Print-100x108"
Add a bit of color to your bedroom setting with this Jaipuri Tie n Dye Hand Print Designer Pure Cotton Double Bedsheet Set. It is graced with latest Designs to give an ethnic yet modern glance to your room Decor. 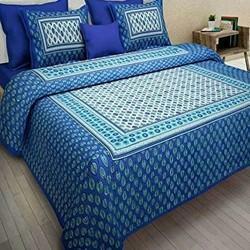 This beautiful bed sheet set is a specialty of Jaipur. Made from 100% Pure Cotton, this Bed Sheet ensures durability. The bed sheet set is in bright and traditional Rajasthani Hand-Block prints to enhance your decor. 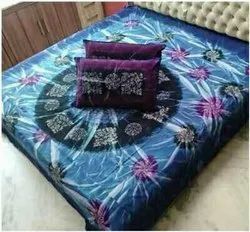 The matching Two Pillow Covers that come with this bed sheet completes the whole look of your bed and bed sheet.